Women's Health Magazine | Joan Lunden in support of The Breast Density and Mammography Reporting Act that would require all mammogram reports to explain in clear language whether dense tissue is present, the effect of dense tissue in masking cancer, and recommend women discuss with their doctors whether additional screening is necessary. How Dense Are Your Breasts? Why did Joan Lunden get a breast ultrasound... and should you get one? NBC I Today.com I Why did Joan Lunden get a breast ultrasound... and should you get one? Joan Lunden at the Susan G. Komen Honoring the Promise Gala. People Magazine | shares the news on Joan Lunden becoming a grandma! Joan Lunden will host Camp Reveille despite her breast cancer diagnosis. Article on Page Six. CNN | Former GMA anchor Joan Lunden talks about shaving her head after being diagnosed with breast cancer. A tiny spot on a precautionary ultrasound that former "Good Morning America" co-host Joan Lunden received after getting an all-clear on her annual mammogram was the first sign of trouble. A biopsy was taken. CNN | Joan Lunden tells Dr. Sanjay Gupta how she sprang into action after her initial breast cancer diagnosis. Joan Lunden returned to "Good Morning America" this morning to reveal she has been diagnosed with breast cancer. Joan Lunden holds the record as the longest-running anchor in morning news, beginning the day with viewers of ABC's Good Morning America for seventeen years. 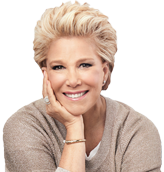 The Best Ever You Show is proud to welcome Joan Lunden to the show! Joan Lunden helped millions of Americans greet each day as host of ABC-TV's Good Morning America for almost two decades.